Clean the mustard greens thoroughly and wash any sand or dirt away. The large lower stems can be discarded, or finely chopped and cooked along with the greens. Dice the onion while heating a large stock pot over med high heat. When hot, sweat the onion in the 2 T olive oil until translucent. 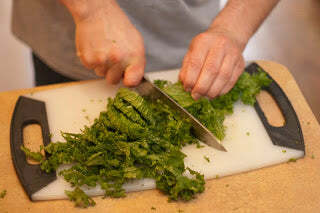 While the onions cook, begin cutting the mustard greens into ½ inch thick strips with a large chef knife. Add greens to the pot on top of the onions in bunches; as the greens wilt and break down, add more to the pot in batches until all the leaves have begun to break down. Season with the pepper flakes, salt and pepper – a few pinches of each should be fine at this point. Add the beer to the pot, bring to a slow simmer, partially covered, for 20-30 minutes. 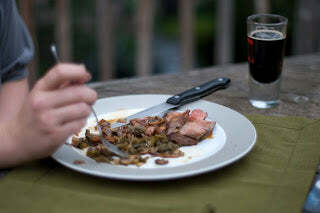 Stir occasionally and taste for doneness and seasoning – the greens should be tender, but not mushy and the beer should be mostly gone when the greens are cooked. 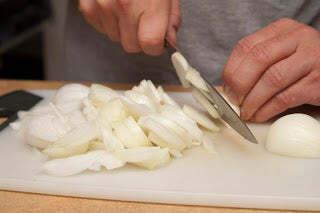 Peel the onions, cut in half from top to bottom, the slice the halved onions into thin pieces. Clean the mushrooms well, then slice thinly. Heat a large saute pan over medium high heat. Cut the bacon into ¼ inch strips. When the pan is hot, add the bacon, cooking until evenly browned and crispy and the fat has rendered. Remove the bacon from the pan with a slotted spoon to a plate or bowl, reserve for later. Be careful not to burn the bacon fat! Add the sliced onions to the hot saute pan with the bacon fat, cook until slightly brown. Move the onions away from the center of the pan to the edges, then add the sliced mushrooms to the vacant center of the pan. The mushrooms will brown slightly, and may release a good amount of water. If so, simply cook over fairly high heat to cook the water out, when the pan dries out the mushrooms will continue to brown. Season lightly with salt and pepper. 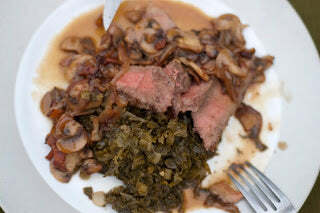 When the mushrooms are cooked, take the pan off the heat, but keep warm and handy to garnish the steak. 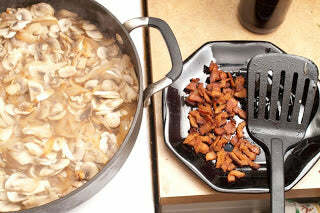 You can now mix the crispy bacon back into the onions and mushrooms. 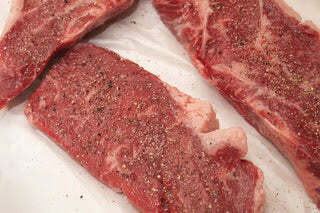 Season the steaks liberally on both sides with the salt and pepper. Begin heating a large saute pan over medium high heat. 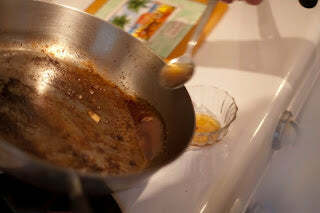 Add the oil to the hot pan and sear the steaks. If the steaks do not fit all at once, work in two batches. 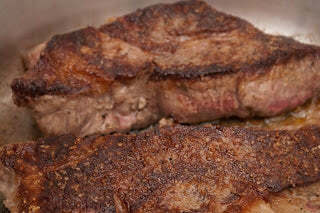 Brown the steaks evenly, cooking approximately 3 minutes a side for a medium doneness, this will vary depending on your preferred doneness and the thickness of the steak. 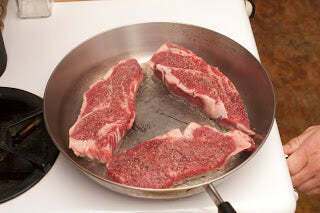 Remove the steaks from the pan to a plate or rack to rest while you make the sauce. 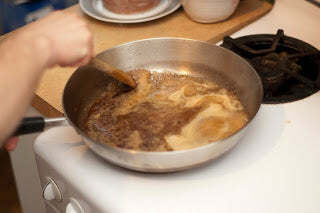 Carefully spoon any excessive fat or grease from the pan; you should be trying to take advantage of the browned bits at the bottom of the pan, not the cooking grease left behind. Return the de-greased pan to the fire. 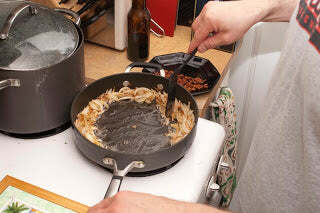 When hot, add the beer to de-glaze the pan by scraping up any stubborn browned bits with a wooden spoon or spatula. 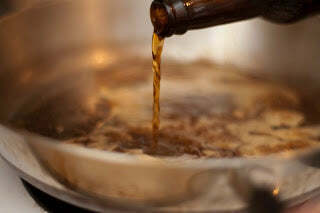 Boil to reduce the volume of the beer in the pan by about 2/3, or roughly 3-4 ounces remaining. 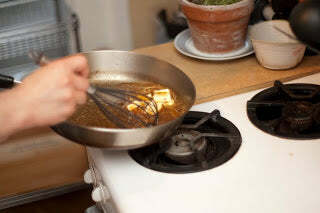 Remove the pan from the heat, let it rest for a moment while you cut the softened stick of butter into chunks. 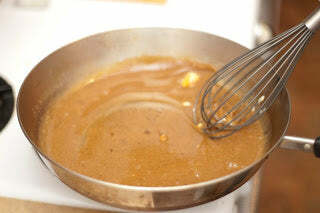 This butter will melt and emulsify into the reduced beer to finish the sauce – this should be done with care, using a whisk to mix the melting butter into the reduced beer. Expert Tip: The grade of steak can impact the overall taste and flavor of the meal. Choosing a high quality grade from your local butcher or buying steaks online from a company like Chicago Steak Company will really make this dish stand out. 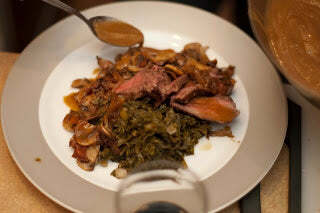 Plate the steaks, which you can carve before plating if you like, with the beer braised greens and crispy bacon, onion and mushroom garnish. 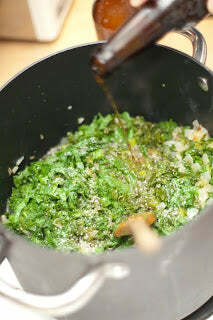 Spoon the beer-butter sauce generously over the meat and greens from the pan with a large spoon. 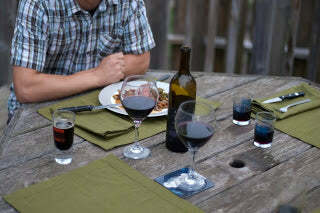 This dish pairs naturally with brown and Scottish ales – don't feel afraid to pair a bold red wine like Cabernet or Syrah either.